Category: Social Sciences History and Philosophy Tags: Brexit, community, EU referendum, history, immigration, Politics by Bryony. Interesting stuff. I’m always suspicious of an assimilation narrative as it can (in my view) lead to undue pressure on first-generation migrants to “adapt or die”. Is there anywhere I can look for further discussion on this? I’m particularly interested in the line that it is “not inconsistent” both to push assimilation and value existing diversity. The numbers are diffrent. Migration levels and migrants numbers are 25 to 30 times greater that in any period of British history. A walk round almost any part of London would confirm that. We are well on te way to cutltural separation which is leading to political separation. 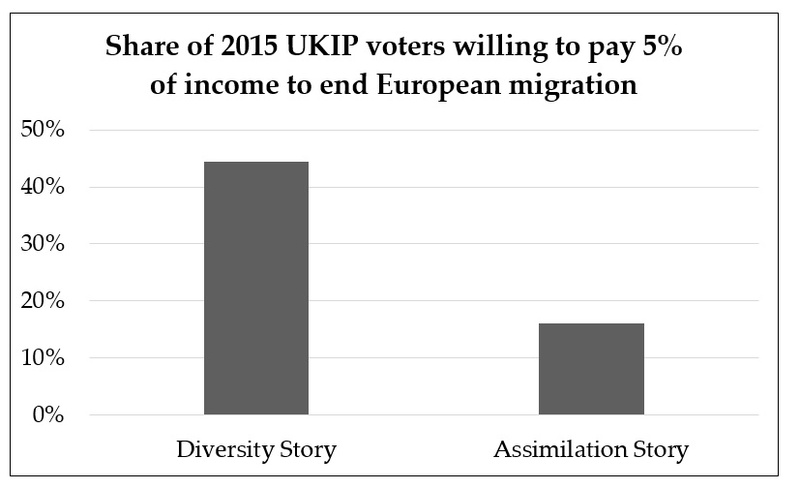 The numbers over the last decade are so much higher than anything previously experienced, the public are (quite rightly) very sceptical about the assimilation story. I note that a very high proportion still want immigration substantially reduced, even with your strong priming. I agree with the sceptics here. Previous immigrations were smaller in number, the population was smaller so more space for expansion, public services were fewer or non-existent, so less pressure on spending, and there was often greater cultural similarity between immigrants and residents. French and Dutch Protestants for example bought a culture harmonious with the residents and skills such as market gardening and silk weaving which added significantly to the economic landscape. This is not to say that modern immigration does not do this at all. It certainly can in many instances, for instance the Polish building trade, Afro Caribbean music and dance, or Asian cuisine. But we also now have groups of immigrants who set themselves against the cultural norms of the host country, even defining themselves in opposition to it, and large scale unskilled immigration which reduces the wages and opportunities of the poorest sectors of the host society. Also, some immigrant groups are divided amongst themselves and bring their pre-existing conflicts into the host realm, while others have customs which are alien to the host nation’s laws and values leading to a perception among residents of exceptionalism in the application of the law, and even a reluctance by some authoriies to act at all against serious abuse.